Benefit from Bruno’s compact Curb-Sider. Bruno’s dependable hoist-style lift for scooters and powerchairs, the Curb-Sider’s space-efficient design lets you keep third-row seating when a mobility device isn’t present in most vehicles. Stand by the bumper, connect a docking device, push a button and the Curb-Sider lifts and stows your mobility device. 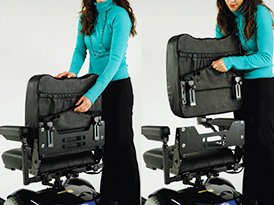 The Bruno Curb-Sider provides power lift and rotation to easily stow your mobility device. With vehicle-specific designs, you can be confident that lift will be installed safely and securely in your vehicle. Because the Curb-Sider can be transferred to another applicable vehicle, you can enjoy the freedom and independence of your lift for years to come. With customization options such as a telescoping off-set arm and a fold-down lift head, the Curb-Sider can be installed in a wide-variety of minivans, SUV’s, smaller crossover vehicles. In some applications, you can even maintain third-row seating when the mobility device is not present.